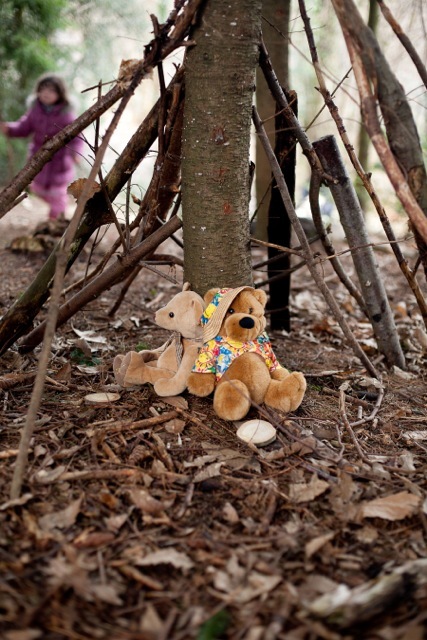 lucyslittleforestschool – Going on a Bear hunt! We will listen to the story of ”We are going on a bear hunt” We’ll go on an exploring walk hunting for the bears at Wilderness wood. We’re not scared!! we’ll investigate sounds, shapes, and textures along the way. When we find the bear, we discover that he’s more scared of us than we are of him. He hasn’t got a safe place to live, so we’ll make him a home from the woodland materials, a garden to play in and collect from food to have a picnic. If you would like to bring a snack for your child to sit with bears and have a short but sweet picnic please do. Bears welcome, please bring your own bear.